We are offering Karl Fischer Titrators to our client. Versatile, compact, rugged and easy to operate instrument to determine moisture contents in liquids & powders. 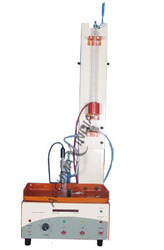 Supplied with 250m1 Reaction Vessel, Dual Platinum Combined Electrode, Teflon Paddle, Teflon Assembly, Moisture Trap for Reaction Vessel & 250m1 Amber Reservoir Bottle, Dispensing Tube (05 Nos), Teflon Tubing for Dispenser, Operational & Instruction Manual, Manufacturer Test Certificate and Warranty Card. To buy Karl Fischer Titration, contact us. We are renowned as Karl Fischer Titration System Supplier. Karl Fischer titration is a classic titration method in analytical chemistry that uses coulometric or volumetric titration to determine trace amounts of water in a sample. 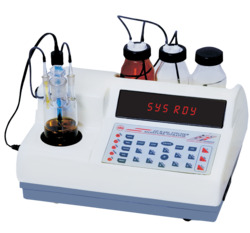 Karl Fischer Titration System can be purchased in different designs from us.